When you go to a market for an induction cooktop you look for one which is stylish, efficient and does whatever it is asked to do without giving any problem. This induction cooktop is the first one that comes to mind and rightly so because of innovations made in its design and performance. The brand name Philips further adds credibility to it. The whole body of this induction cooktop is made from plastic with a glass top so weight and electrocution aren’t any issues. Glass top also facilitates its easy cleaning. Those stands provided provide a lot of ground clearance for cooling of this device so that overheating does not take place. It is very easy to operate as the layout is very simple. User manual and LED display provided also makes the job easier. Since it is an induction cooktop which uses radiation instead of an actual flame to heat things you can cook for hours and still not sweat as there is not heat produced. It is also efficient so you don’t have to worry about electricity consumption at all. You can use any utensil with a steel bottom so expenditure on special utensils is not required. You can choose between different cooking modes based on what type of dish you want to cook. Power cord is a bot small though so you can’t move the appliance a lot. Based on it’s features and reviews it would be safe to say that this induction cooktop is one of the best cooktops available in the market today. 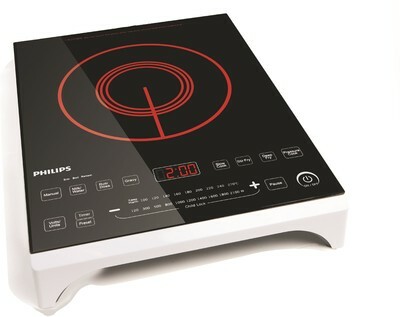 Philips Company has delivered a product which is everything a customer wants in an induction cooktop. Its practical design and superior technology has enabled this cooktop to race ahead of the competition.